To say my elk hunting career isn't the typical beginning to this long tradition would be an understatement. It pains me to say it, but I could be considered the trust fund kid of elk hunting. Which my Dad takes pleasure in reminding me of every year. Each year my Dad, Lee (a long time friend and original member of our 3 man hunting group), myself and the occasional elk hunter who has seen the product of our hard work, go on a 10 day elk hunting trip with llamas. We (and when I say we I mean my Dad and Lee) own 4 llamas. 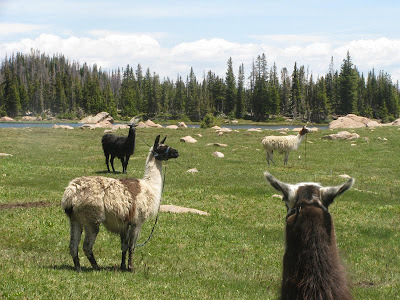 The four llamas, Dante, Scooter, Feathers, and Licorice are truly great animals. Each has their own personality uniquely different from each other. Dante is our lead animal, very stoic and strong. Scooter is the powerhouse, sometimes I think he can haul as much as a Clydesdale. Licorice reminds me of Andre The Giant in the movie A Princess Bride, a little slow yet very lovable. And finally Feathers who is happy to regurgitate his cud and spray it on anyone who even ponders the idea of approaching him. Each animal is a gilded male (neutered) and each has his place in the pecking order. In the beginning we only had two llamas, Dante and Scooter. It took one full spring and summer to train them to pack. The beginning of the process was very difficult considering I had no experience with llamas in the past. Little things, like making sure their backs we clear of debris before putting on the saddles, took weeks to master. 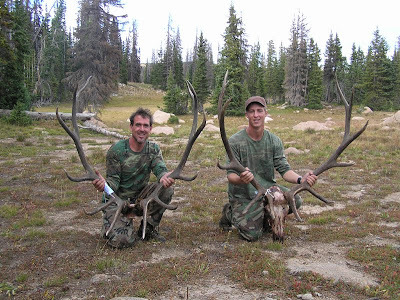 But after a whole summer of continuous work (a minimum of several hours a day 3 to 4 days a week) Dante and Scooter ended their first season packing out TWO Pope & Young bulls. Having successfully used our two llamas for the first time we jumped on the chance to acquire two more. You would be surprised how easy it is to find people giving away llamas. A co-worker of my mother-in-law owned Licorice and Feathers, he was as pleased to get rid of them as we were to have them. The new, untrained llamas saw how hard Dante and Scooter worked, which made their own training a breeze. The benefits of being born to a elk hunting legend (in his own mind) are brought up annually. Even if they weren't I can't help but think of how lucky I am. Without the llamas we wouldn't be able to responsibly hunt as far back in the wilderness as we do. I simply would not have the confidence to hunt where ever, and I do mean where ever my body can take me. 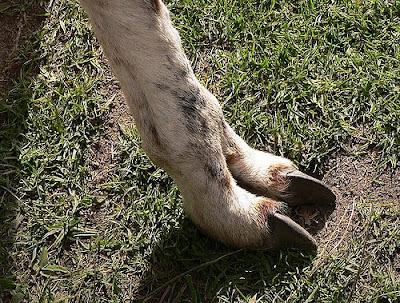 With a split hoof made much like an elk's, llamas can go almost anywhere an elk can. This completely alleviates the little devil that pops up on your shoulder saying "Do you really think we should kill an elk all the way back in this hell hole?" Another great benefit is the maintenance free aspect of llamas. 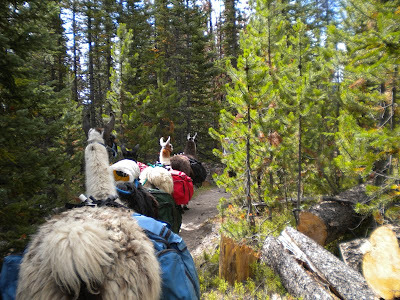 Once we arrive at base camp and stake out the llamas (which takes a total of five minutes), we do not have to feed or water them after a long day of hunting. 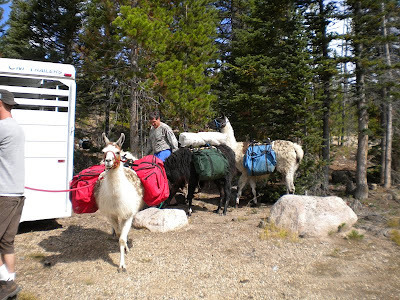 Only every three days do we move the llamas to a new grazing area. We also take them to water every few days, but more for our own conscience than their needs. Being kin the the camel, we have seen them not drink for over 14 days even though we've brought them to water several times. Most the areas we hunt have plenty of moisture in the vegetation. Some people have asked "Why llamas and not horses?" In our opinion, the two biggest reasons are the cost, and 1000lbs of nervous muscle. The year round maintenance costs for a llama is less than half that of a horse. If the cost of a horse isn't a problem (remember I am just a blue blood of elk hunting, my bank account could bring a grown man to tears) then maybe riding a horse that spooks will convert you to llamas. Over the years I have known plenty of hunters whose horse has spooked, tossing them for a loop. Horses are big and strong enough to do what they please with their rider. Llamas on the other hand are roughly 400 lbs and don't spook easily. Since you can not ride a llama there is no chance they will buck you off. I have personally seen a sow and her two cubs walk within 100 yards of our llamas, the only thing they did was an alarm call. The best way I've heard a llama alarm call described is that it sounds like a lunatic laughing uncontrollably. Just to be clear, I am not saying that getting hurt by a llama hasn't happened, I have just not personally heard of it or seen it. I also understand that not every horse spooks, but unless you are fortunate enough to use good horses, they can be flat out dangerous. I owe much of my elk hunting success to the animals that make hunting deep in the wilderness a possibility. Using our 4 llamas is a privilege that I am thankful for. I always try to remember how lucky I am to have these great animals. And if I ever forget, all I have to do is wait until the following bow season for my dad, "a guy from Detroit", who early in his hunting career thought wild elk to be as elusive as the unicorn, to remind me of my inheritance of his blood, sweat and llamas. Several other thoughts: Even though we train our llamas to pack all our gear, I always carry my bow and arrows in my hand. Losing the most important tools for dispatching elk on an elk hunting trip can bring rain to any parade. I also learned the hard way to spend the extra money on quality arrows that don't break if they ricochet off a dandelion. I bought dozens of the cheap arrows under the mind set that arrows break (only because I buy the cheap ones) when they hit the ground. Now I only shoot Carbon Express Heritage 250s. The extra money spent up front far exceeds the money lost in the long run. These arrows are by far the best I've found. Of the thousands of arrows I've shot this summer I can only remember breaking two. One at the Colorado Traditional Archers Society shoot on the Iron target course, which breaks any arrow if you miss, and one was scratched pretty deep off of a rock while shooting at my local range in Golden. So when packing with llamas, I suggest caring your bow. It is also well worth the extra money for quality arrows, such as the Carbon Express Heritage shafts.